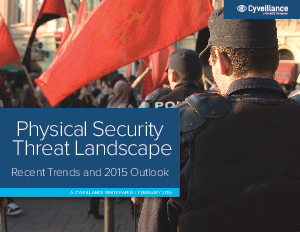 In this white paper, we examine notable trends and events in physical security from 2014 and assess what security professionals should expect in 2015. 2014 was truly an unpredictable year in the physical security and executive protection worlds, as large scale events targeted for disruption were executed relatively smoothly, while unforeseen developments in Ukraine and the Ebola outbreak caught many off guard. Looking ahead to 2015, we predict that local issues will continue to gain global importance, threat actors and activists will find new ways to utilize social media to spread their messages, and the lines between physical and digital threats will continue to converge. We also highlight ongoing developments in France, Mexico, Ukraine, and Germany.